At Budget Blinds of Comox Valley, Campbell River and North Island, we're your local neighborhood experts that truly understand your needs. We're in your neighborhood, we know the local Comox Valley, Campbell River and North Island weather and community, and we’re backed by the #1 provider of blinds, shades, and drapes in North America. Over 25 years of customer satisfaction gives you peace of mind that only comes with choosing the proven leader. We bring the showroom to you in Comox Valley, Campbell River and North Island. We expertly measure your space, install beautiful window treatments, and back it up with the best warranty in the business so you can sit back and relax in the beautiful, Comox Valley, Campbell River and North Island weather and sunshine. We serve to give you the best in window treatments, so you can rest easy knowing your space will be beautified and optimized with window treatments that fit your individual needs. "We feel very privileged to live in, and serve the Comox Valley community. We love seeing our clients homes transformed, and their visions brought to life! " 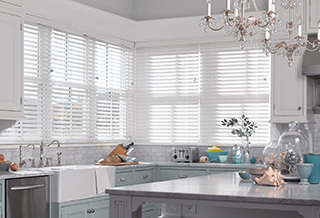 If you’ve been thinking about transforming your home’s interior into something truly special, Budget Blinds of Comox Valley, Campbell River and North Island is here to help. Our expert design team, paired with an array of stunning blinds, shades, shutters, drapery, and more creates the ideal home interior that complements any room, or an entire home. From the latest styles and innovative fabrics, to a host of on-trend colors, we’ll show you how fun and affordable it can be to upgrade your décor with the power of the #1 provider of custom window coverings in North America. Our consultative process is designed around caring about you and your home. We make the entire experience easy and convenient as we bring the showroom to you with our FREE in-home design consultation. From those unique shaped windows to energy efficient treatments, and more, Budget Blinds does it all for you, with style and service for any budget! We're local and here to stay to ensure you have peace of mind. We're very grateful to not only service the Comox Valley, but to be involved on a community level! Our team prides itself on being active with many community groups from the Chamber and Rotary, to non profit organizations! Having moved into our current home nearly 2 years ago we wanted to have new blinds in our bedroom. Unfortunately once we received the blinds(purchased elsewhere)there was a problem with them. Deena our consultant solved the problem immediately and had the blinds replaced. We then decided to order blinds for several other windows in the house. We received all of our blinds today and they look absolutely beautiful. Deena is very professional, reliable and has a lovely personality and it was a pleasure having her as our consultant. She sorted out a difficult situation for us and we are most grateful. Pete who installed the blinds was also punctual and very personable. He did a great job with the installation. We are very happy with the service we received and we highly recommend Deena as a consultant and Budget Blinds as a company. "...I just wanted to let you know how pleased we are with our blinds, it does the job of keeping the light out and looks great. Deena was very professional, and obviously did her job very well, hence the reason we were sold on your product. I will contact your company for any further needs we may have. – Port Hardy Chamber of Commerce -.